Cycling to Sentous, the view inspires to peddle harder! The sun is rising a few degrees more from the north east each day. 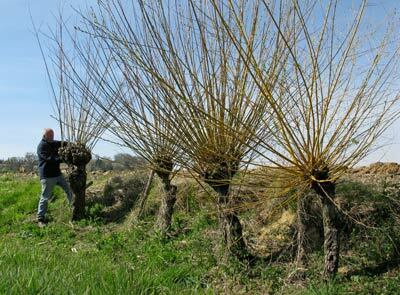 The willow hedge starts to take shape. Next year we can finish it. Las trios locas in Spain for the day. As you do. April came with its showers, which seemed non stop. The temperatures we had been enjoying in March suddenly dropped and we were burning logs at a great rate again. Meanwhile, northern Europe was having glorious weather. Very strange. All the farmers are happy that they were able to work their fields before the downpours, now to have the window of weather to plant the maize. 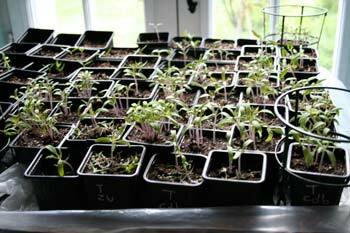 This wet, cold stuff is not helping the seedlings at all. They seem to have gone into slow motion and don't look at all healthy. Looks like we'll have to go to the market and buy some plants instead. This weather has convinced us to build a greenhouse against the south east wall of the small barn. That will allow us to grow more earlier in the year and for longer. Just another project to add to the rest. Coming home a few evenings we have caught the eyes of deer in our headlights, at the bottom of the garden. They have been stripping the trees of bark and have decimated several fruit bushes. The grillage we put up to protect each plant is effective if a little ugly, so we were inspired by our friend Clare, who has planted a hedge made of willow shoots. It has taken and now grows profusely to create a natural barrier and looks very pretty too. Asking around we managed to get a couple of trailer loads of branches and even cut the shoots from our neighbours trees (with their permission of course!). By digging a row of holes, and plunging four branches in each, we started to create a weave down the garden. The south and west sides now have a very pretty hedge and next year we will be able to cut the new crop of branches from our friendly sources and complete the job. 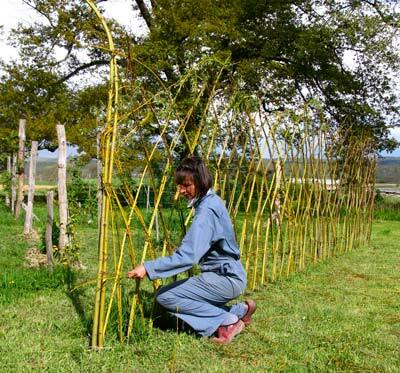 Since we'll be having chickens running around soon, we will need to weave smaller branches horizontally through the hedge, from the ground up to about knee height to stop them from getting to the gooseberries, loganberries and raspberries! The vegetable garden takes a lot of hard work to keep it in order, especially with a clay soil and the amount of rain we have had lately. 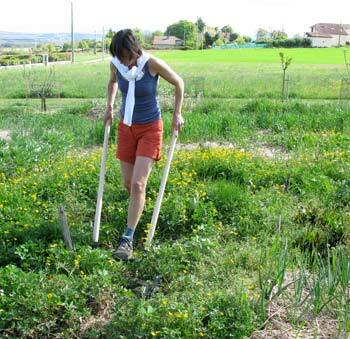 Caroline discovered the Grelinette, a broad fork with two handles that makes digging a lot easier. It loosens the soil and the roots of weeds, but doesn't disturb the soil layers. Using a rotivator slices up the weed roots into many pices and so multiplies their chance of spreading. The Grelinette allows you to pull the roots out completely. The bales of straw we put on the garden to keep the weeds off in the winter worked well, but there was a lot of corn grain amongst it and they germinated. So now we have a small cornfield that we're busy removing. 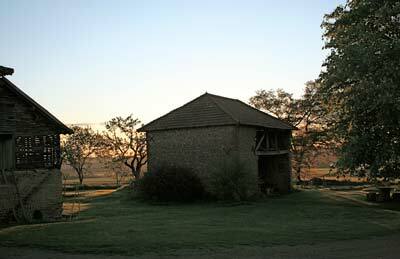 Once the straw is removed and the earth begins to dry out, we can work with the Grelinette. Still, a couple of square metres per visit is enough. Gradually we're taking control of the garden again. For more info about the Grelinette, or broadfork, look at this site. 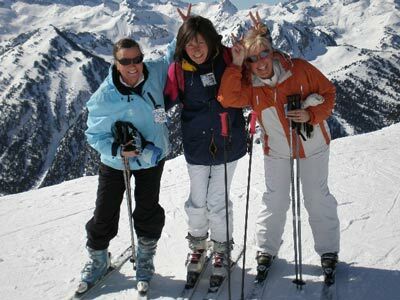 Caro joined the ski fans again, this time in Spain at the Baquera. A resort favoured by the Spanish royalty and stars alike. It's an enormous place, with loads of lifts and runs. Perry is very jealous, but with his knees, it would be a disaster.